I have typed out two rather dull, uninteresting posts today. Now stop that!! I hear you saying "So tell us something new." (***sniff, sniff, you have cut me deeply...) Anyway...as I was saying...I have a bit of blogger's block today. It wasn't so much that I don't have things on my mind as much as trying to put them to paper...errr..to computer as the case may be. So rather than publish either of the two that I may or may not foist on you in the future, I decided to go back to some of my truly awful poetry. Yeah, you heard me...poetry. When I get bored, I write bad poetry. These two rather unremarkable poems were actually written for a friend of mine over at We Work For Cheese. Nicky who is super-duper cute and fun, had a 30 day blog challenge not long ago and I wrote these poems to go with a couple of her posts. Nicky has a thing for shoes. She loves them and can't get enough of them. I seriously don't get why shoes are so revered these days but hey...what ever makes people happy. She does get my total awe in the fact that she can walk all day in stilettos. Did I not warn you? 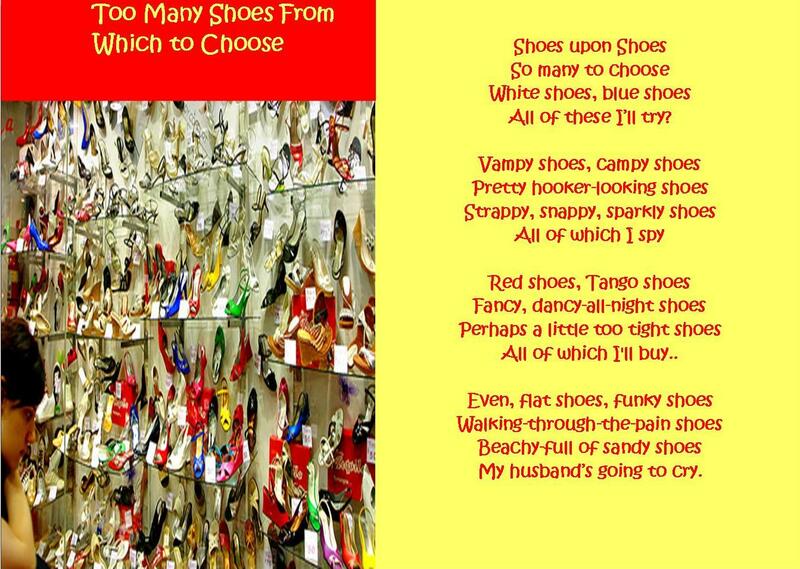 I am not a poet...I am a cynic that doesn't understand shoe collectors. Thought Number Two ---Nicky Wrote a Poem to which I wrote a sequel. 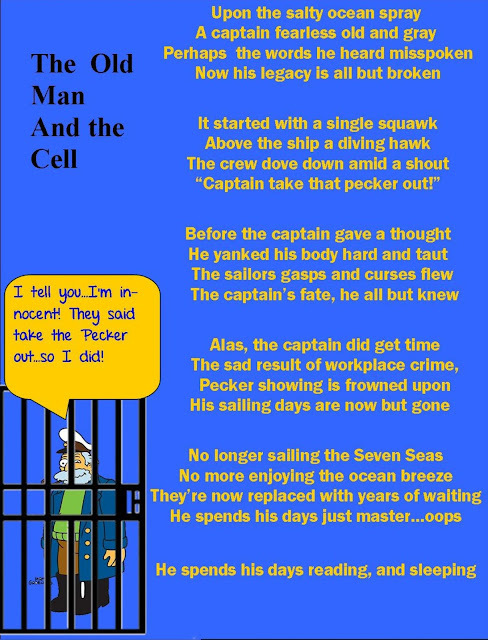 Nicky wrote a great poem called The Rhyme of the Mariner. I encourage you to go over and read it. I wrote a little sequel that I have edited for the purpose of today's post. You will see why...shortly. Sorry, in advance for my poem. So there you have it. Two really lousy poems to tide me over till I think of something entertaining and worthwhile to say. Hopefully soon. I laughed so hard at the second one I almost choked on my drink. You are hilarious. I laughed so hard the second one was great! HAHAHAHAHA! I love the second poem. I went and read the beginning first and then finished with your sequel, I didn't know what you could add to the first part, it was so good. But then you topped it and and left me smiling and laughing. Kimberly, your the best! So glad you didn't choke. What would your little cuties do? I am glad people are finding that funny. I always worry about who is going to be appalled. I once took a poetry class and the professor made the point that good poetry should never be "sing song". Well, so much for that. I only like rhyming sing song type of poems. Dr. Suess is my kinda guy. Thank you are being kind. Hope you have a good week, Trina. Cheryl, you should know that no one around here is offended. You write poetry about like I do and it's fun. I have only one question: Do you like green eggs and ham? I love Green Eggs and Ham! I think Dr. Seuss was genius. Didn't you do a post once on the overuse of the word genius. Seriously, Seuss was.. I agree about enjoying fun poetry over good poetry. The more complex a great poem is..the more it is lost on me. My ability to create poetry is right up there with my ability to resist cupcakes- nonexistent.. I think you did great. Yep, my poetry education starts and stops with Dr Seuss. Blog blocked or not, an enjoyable post. Surely no one can resist a cupcake! Why would anyone even try. Thank you! I find if there is too much going on, I have trouble focusing on one item and condensing enough to not ramble. Yesterday, it just wasn't coming together. fun to have fun...reading and thinking and writing!! we could all be a little happier if we lightened up a bit. I'd say that for someone with writer's block, you did pretty good with some fun poems. I agree. Isn't it interesting though how some days it's just easier to lighten up and some days there is just a bit of a funk that settles in. It helps when I read other blogs that are funny or inspirational. Thanks, Mike. I still think that an ice cream bar should go with just about anything. It is too fun to say. So we read and we laughed. You are such a good blogger friend..very kind of you. Is the reason I muddle through. Talk about writer's block.... it's taken me two days to come up with something better than "Nice post, Cheryl" after you were so enough to say such sweet things about me and give me an awesome shout-out. 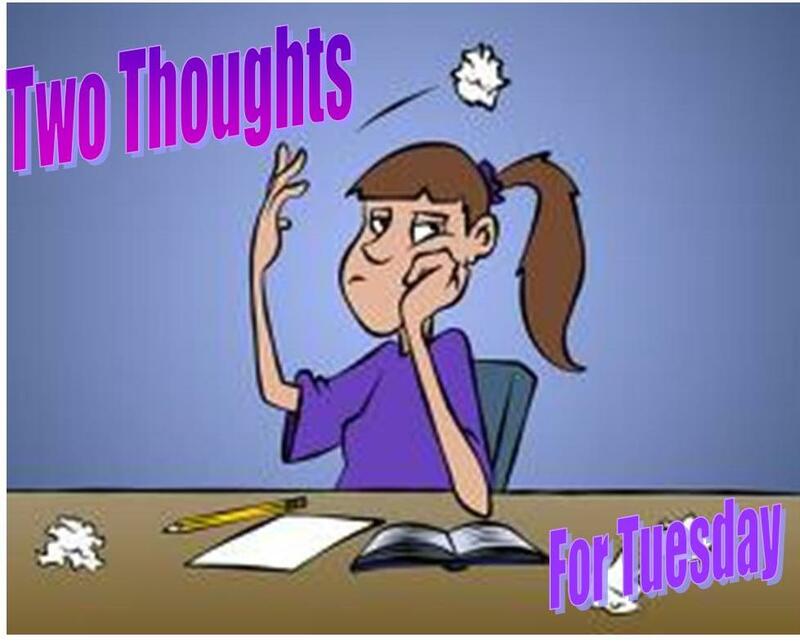 After trying for most of the day on Tues trying to come up with a topic, I went back to see what I could resurrect and decided on a couple of my graphics. Of course, they make next to no sense without out your involvement. I hope people appreciated the original poem you wrote that I spawned my little graphic. I'm good, but ridiculously busy... which is why I haven't been around much. As much as I made fun of Mike about Dobson, I feel bad for him too.